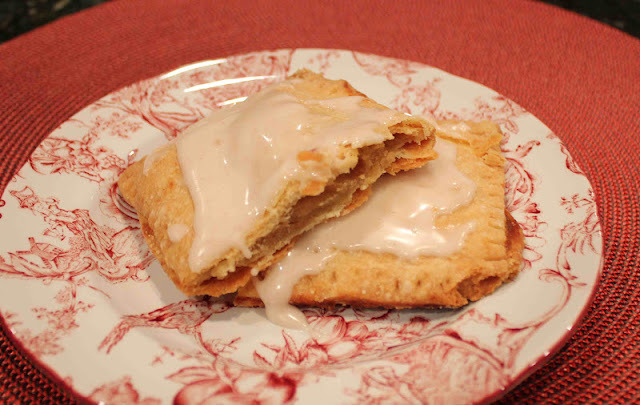 When you were a kid, did you ever eat those rectangular-shaped pre-baked extra sugary and extra-thin pastries known as Kellogg’s Pop Tarts? I know I did! While Pop-Tarts (to me) don’t taste like anything spectacular, they were quite addicting and I enjoyed trying all the different flavors when I was a kids. My favorite was some sort of berry flavor that had purple and teal striped frosting! 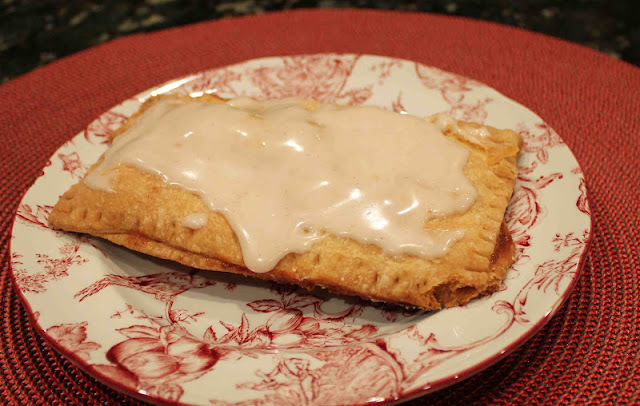 While pop-tarts were fun and colorful, we all know that PillsburyToaster Strudels really were the pastries that tasted better! 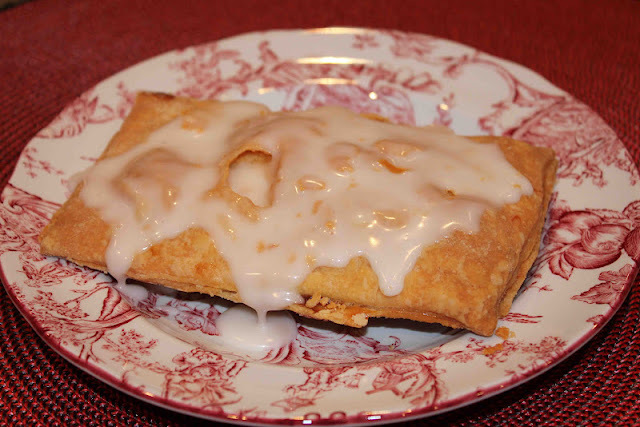 I loved squirting the white vanilla icing on the piping hot flaky crust. However, my icing never looked as pretty as the ones did on the box. Now that I’m all grown-up, its time to act like an adult, get in the kitchen, and make some pop-tarts from scratch! While dubbed “pop-tarts”, these homemade pastries taste more like toaster strudels. 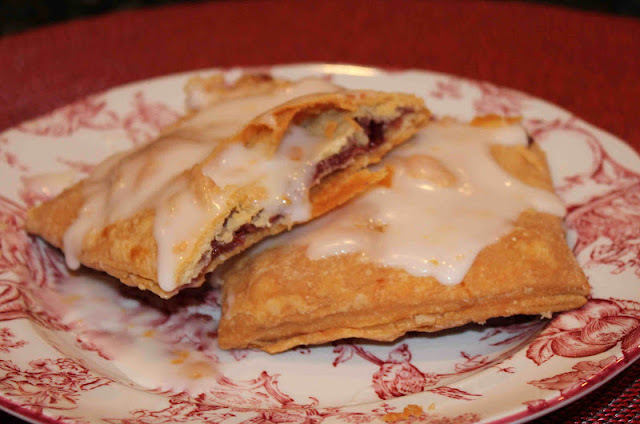 The crust is buttery and flakey, the filling sweet and delicate, and the icing decadent. It’s like eating a homemade pie in your hand. We made two different fillings: raspberry and apple-cinnamon brown sugar. Both flavors were excellent. I can’t tell you which one I like better… it depends on what mood I’m in! Enjoy!!! 1. Position a rack in the center of the oven, and heat the oven to 350 degrees F.
2. Remove the dough from the refrigerator and divide it in half. Press each half into a rectangle. On a lightly floured surface, roll out each half into a 28-by-11-inch rectangle. Using a pairing knife, lightly score one rectangle into eight 3 1/2-by-5 1/2-inch rectangles (each about the size of an index card). 3. Brush the top surface of the entire scored rectangle with the egg. Spoon 2 tablespoons of the jam in a mound in the center of each scored rectangle. Lay the second large dough rectangle directly on top of the first. Using fingertips, carefully press down all around each jam mound, so the pastry sheets adhere to each other. 4. Using a knife, a pizza roller (easier), or a fluted roller (easier and prettier), and following the scored lines, cut the layered dough into 8 rectangles. Place the rectangles, well spaced, on a baking sheet. 5. Bake for 40 to 45 minutes, or until the tops of the pastries are evenly golden brown. Let cool on the baking sheet on a wire rack for about 30 minutes. 1. Using a stand mixer fitted with a paddle attachment, mix together flour, sugar and salt for 10-15 seconds, or until combined. Scatter the butter over the top. Mix on low speed for 1 to 1 1/2 minutes, or just until the flour is no longer bright white and and holds together when you clump it and lumps of butter the size of pecans are visible throughout. 2. In a smal bowl, whisk together the egg yolks and milk until blended. Add to the flour mixture all at once. Mix on low speed for about 30 seconds, or until the dough just barely comes together. It will look really shaggy and more like a mess than a dough. 3. Dump the dough out onto an unfloured work surface, then gather it together into a tight mound. Using your palm and starting on one side of the mound, smear the dough bit by bit, starting at the top of the mound and then sliding your palm down the side and along the work surface, until most of the butter chunks are smeared into the dough and the dough comes together. Do this once or twice on each part of the dough, moving through the mound until the whole mess has been smeared into a cohesive dough with streaks of butter. 4. Gather up the dough, wrap tightly in plastic wrap and press down to flatten into a disk about 1 inch thick. Refrigerate for at least 4 hours before using. The dough will keep in the refrigerator for up to 4 days or in the freezer for up to 1 month. Replace the raspberry jam with Apple, Cinnamon, and Brown Sugar Filing, and replace the Simple Vanilla Glaze with Cinnamon Glaze. (See the recipe below). In a medium saucepan, melt the butter over high heat. Add the apples and toss around with a heat-resistant spatula for 2-3 minutes, or until they just start to soften. Add the sugar and continue to toss for another 3-4 minutes, or until the sugar has melted and mixed with the apples. Remove from heat and transfer the apple mixture to a medium bowl. Let cool for about 30 minutes, or until no longer hot to the touch.Add the egg, cinnamon, salt and flour to the apple mixture and mix with a rubber spatula until they are thoroughly and evenly incorporated. Let cool completely before using. One Response to "Homemade Pop-Tarts"
a VERY limited budget. Does anyone have any cheap but good low-carb recipes to share? I’m not looking for links to low carb recipe websites, I would like actual recipes that you use, maybe anything you’ve produced up, thats both inexpensive and delicious. Thanks!!. I would such as any kind of main dishes or perhaps side dishes, that are low carb and don’t use expensive ingredients.. Thanks and so a great deal! !.